Nuclear Physicist Enrico Fermi was awarded the Nobel Prize in Physics in 1938. Courtesy of the U.S. Department of Energy/Flickr. The general public may view the scientific enterprise as rational and methodical, moving forward in an orderly, cohesive way. But science moves in fits and starts, sometimes forward and sometimes backward, sometimes methodically and sometimes quite by accident. 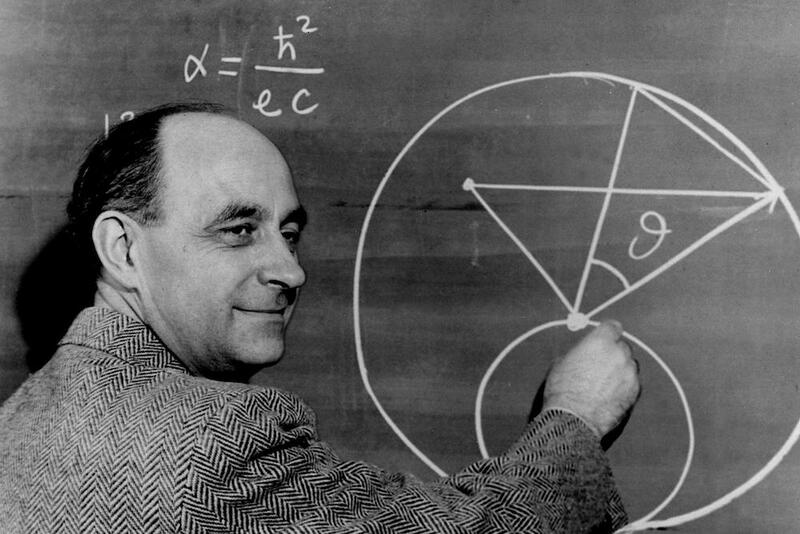 The extraordinary role that chance and accident play in scientific discovery can be seen in the remarkable career of Enrico Fermi, one of the 20th century’s greatest physicists. Fermi is known primarily for his work on neutron physics, nuclear fission, and the experiments that led to the first atomic bomb. In October 1934, Fermi was leading a small team in Rome to create radioactive elements by bombarding various elements with neutrons, the heavy neutral particles sitting in the nucleus of most atoms. In doing so he split the uranium atom. But for a variety of reasons, having to do mainly with the limitations of his team’s radiochemistry, he did not know this at the time. However, his colleagues did notice that bombarding an element while it was sitting on a wooden table, surprisingly, made that element more radioactive than when it was sitting on a marble table. It was not a result they anticipated, and they might not have noticed it but for their curiosity and powers of observation. Looking for an explanation, they brought the phenomenon to Fermi. Fermi thought about it and concluded that the lighter nuclei in hydrogen and carbon in the wooden table acted to slow down the neutrons, giving the neutrons more time to spend inside the atomic nucleus and damage it—hence the increase in radioactivity. He conducted a confirmation experiment with a block of paraffin between the neutron source and the target—paraffin has a lot of hydrogen and carbon, so is ideal for these purposes. It is impossible to overstate the importance of this accidental discovery. The work that Fermi subsequently led to exploit this revelation, culminating in the development of the first nuclear chain reaction on December 2, 1942 in Chicago, was based entirely on the “slow neutron” effect. The graphite bricks that formed the structure of the first atomic pile served as a moderator to slow down the neutrons emitted from the uranium slugs embedded throughout the pile, enhancing the probability of fission. Not only are all nuclear reactors based on this effect; it was an essential aspect of fission research that led, inexorably, to the development of nuclear weapons. Of course, having been born in 1901, he was too late to contribute to those early years of nuclear physics. He was, however, born just in time to contribute to some of the most important developments of quantum theory. The Fermis of today, to the extent they exist, now work in teams of thousands of experimental and theoretical physicists at CERN, where cutting-edge particle physics occurs but where the scope for individual achievement is sharply constrained. Secondly, there is his accidental encounter at age 13 with a colleague of his father, a man named Adolfo Amidei, who understood that Fermi was a child prodigy and took it upon himself to give the teenager an undergraduate education in math and physics—the foundation upon which Fermi built his career. Third, there is the accident of his marriage to a woman who loved Rome so much that she refused to move to the United States in 1930, when Fermi first wanted to do so. If he had left Rome in the early 1930s, who knows whether he would have done his slow neutron work or discovered fission? Fermi’s science was guided by accident in other ways. There was the simple accident of his birth in 1901, which led him to intellectual maturity in the 1920s, at a time when deep problems of quantum theory were being addressed. As it was, he did not know he had split the uranium atom in his 1934 experiments until 1939, when German scientists announced that in replicating Fermi’s 1934 work they concluded that he had been creating uranium fission. Surely the fact that he used lead shielding on each element he bombarded, which hid the fact that uranium emits a strong electromagnetic pulse when its nucleus is split, is a historic chance event. If he had known that he was splitting the uranium atom, Italy might have developed nuclear weapons long before World War II began, with totally unpredictable consequences. There is also his arrival at Columbia University in 1939, possibly the most historic accident of them all. At Columbia he met the Hungarian physicist Leo Szilard, who had the idea of a nuclear chain reaction long before the uranium atom had been split, and who pressed Fermi into the experiments leading to the world’s first controlled, sustained nuclear chain reaction. If Fermi instead had chosen to go to the University of Michigan in Ann Arbor (where he had friends) instead of Columbia, he would not have encountered Szilard. William Lanouette, Szilard’s biographer, believes that if the two men had not met in New York in January 1939, the atomic bomb may well never have happened. Szilard had the idea of the chain reaction; Fermi was the most knowledgeable person in the world on how neutrons pass through matter. So the accident that placed them in the same place at the same time was the pivot point about which the Manhattan Project turned. Striking as these random events and accidents in Fermi’s career are, the history of science abounds with them. The discovery of the chemotherapy drug cisplatin, the discovery of radioactivity, the discovery of cosmic background radiation, and even the discovery of Viagra, were all made by chance. Emblematic of this outsized role that happenstance has played in science is Alexander Fleming’s discovery of penicillin. The bacteriology professor prepared a series of Petri dishes with bacterial colonies before going on holiday from his lab at St. Mary’s Hospital in London in September 1928. Back from holiday, he reviewed the preparations and, to his surprise, noticed that mold had infested one of them. Examining the dish further, he observed that immediately around the mold colony no bacteria grew. Intrigued, he began a series of experiments and determined that the mold secreted a substance that killed bacteria. Many long years of further work were required, but the result —the first major antibiotic—has changed the practice of medicine utterly and forever, saving countless lives along the way. What can we learn from scientific accidents like the ones that befell Fermi and Fleming? Three lessons jump out. First, the importance of vigilance. In each case, the scientists involved noticed something that they were not expecting. They were looking for one thing, and noticed something completely different. This is the key to accidental discovery. Imagine, if you can, for example, what our world would look like if Fleming simply tossed the mold-infested Petri dish into the garbage rather than study it carefully. A lot fewer of us would be here today. Fermi’s colleagues noticed that their attempts to irradiate a specific target led to incomprehensible results that their team leader, one of the greatest physicists of the 20th century, was able to explain. The slow neutron insight had profound implications not only for fundamental physics but for the world we live in today. Second, the importance of being prepared. In each case, the scientists involved had mastered their particular fields and knew exactly how to recognize a strange result, how to follow up and investigate that result, and how to interpret it in a way that revealed its importance. Louis Pasteur is said to have quipped, “Chance favors the prepared mind.” He could easily have been talking about any of these scientists. Third, skepticism is as important as preparation or luck. When my father, a particle physicist, did his first experiment at the Stanford Linear Accelerator Center in 1967, the initial results, completely accidental, would have utterly changed the world of particle physics if they had been validated. Being a dedicated skeptic, my father had his team take all the equipment apart—which took three weeks—to ensure that everything was working correctly. They found that one piece of the particle detector was faulty, and it was this piece that was responsible for a completely unexpected result. They fixed it, and of course got a result that was sound but certainly not revolutionary. He had, however, spared himself considerable embarrassment. Accidental discoveries are, of course, the exception, not the rule. Most scientists spend their careers methodically exploring interesting questions in their respective fields, and if they are lucky will add to the sum of knowledge as they do so. And some of their discoveries will no doubt be great. Einstein’s discoveries were hardly accidental—although it helped that he was born at the moment he was, not a millennium earlier. David N. Schwartz is the author of The Last Man Who Knew Everything: The Life and Times of Enrico Fermi, Father of the Nuclear Age. His father, Melvin Schwartz, shared the 1988 Nobel Prize in Physics for the discovery of the muon neutrino.